On Thursday I went for a walk up to Cheonan Station and found a foreign foods shop that I’d read about on the internet. Not as big as the ones in Itaewon, but it had various Thai sauces, Indian curry powders and Western deodorants that I might take advantage of in the future. With not much money in my wallet, I didn’t buy anything. I headed over to the railway station and got a couple of maps from the little tourist information office. Then I walked towards home, found a Daiso shop and got myself a cheap set of kitchen knives. 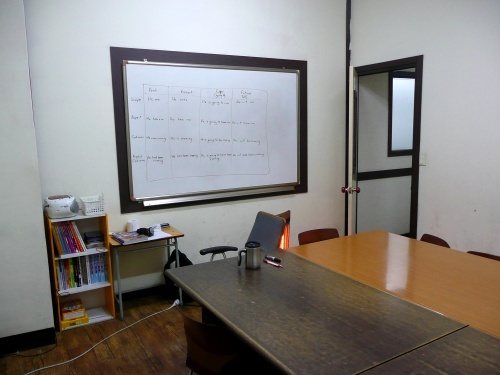 A little later, I was picked up from my flat by one of the hagwon’s older students – a favourite of the director. He took me to a pretty big hospital, Cheonan Chungmu Hospital (in front of which stands a statue of Yu Gwan-sun, a protester against Japanese occupation in the early twentieth century), where I had my medical test. He took me around to the various departments and translated for me. I had a pretty bad headache, having gone to bed straight after work without drinking anything; I didn’t want to take any pills just in case it compromised my drugs test (despite the fact that my doctor had said it was impossible). I discovered that I had a couple of small cavities and that my vision was now 15/15. Presumably, these defects, in addition to my colour-blindness, won’t prevent me staying in my job. The student paid for the test with the director’s credit card. It was ₩104,000, which is about ₩20,000 more expensive than the price for one of the previous tests I had. The director is going to deduct this from my pay, which I’m a bit disappointed about, but it’s not such a big deal that I’m going to be bothered about it. She said (I think – she put in a bit of strange way) that should would give me the money if I signed a second contract – although that’s a pretty long way down the line. The result comes back next Thursday. The day after, we’ll go to Immigration to get me my Alien Registration Card. I thought I might go to a café on Friday morning and do some writing, but I discovered I’d left my backpack at work overnight. With nothing practical to carry my computer in, I decided to go for a walk. I headed in the opposite direction from the city centre towards the nearby smaller city of Asan. I passed over a distinctive circular bridge – there’s a ring-shaped walkway suspended over a big junction with ramps and lifts on each corner. 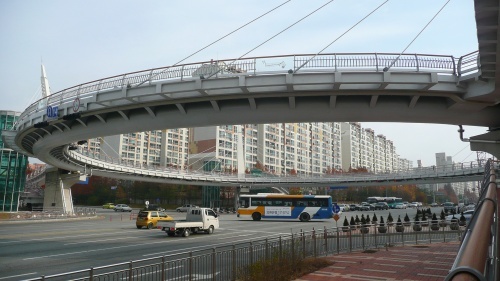 I’ve seen similar footbridge in Japan, but never in Korea before. I had brought my camera with me this time, so I took a few photos. A bit further on, I found a new department store, the Galleria – where the mother of the boy who took me to the hospital works; as he has no more school work to do, he helps her there. It was 9 – 9:30, so too early for the shops inside to be open – so I didn’t go in. 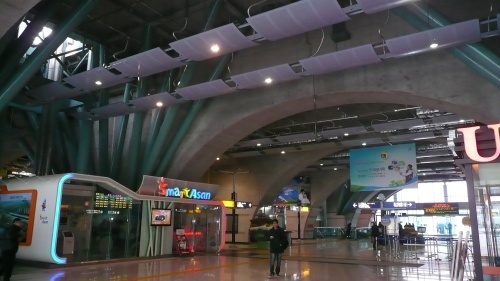 Instead, I carried on a bit further and had a look inside the KTX (bullet train) station, Cheonan-Asan. The track is elevated for quite a long stretch, built on top of some monumental, multi-level arches. Inside, it’s full of huge, tubular metal supports. Impressive, if you like that kind of thing – and I rather do. The area around the station and the Galleria is pretty dead. 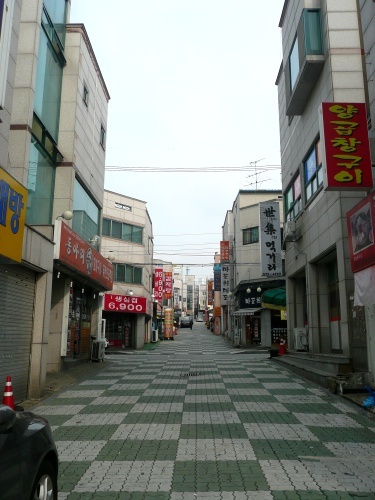 There’s a Lotte Mart nearby, with associated shops, something called E-Mart Traders, some big apartment buildings and an area of new, small buildings that’s very reminiscent of the ghost town-like new development close to where I worked in Bundang. The area seems very symptomatic of the Korean enthusiasm for development. They seem to believe strongly in the idea that, if you build it, they will come. I had some kimbap at the station and headed back home. Then headed out again immediately for another walk – in the other direction, this time. 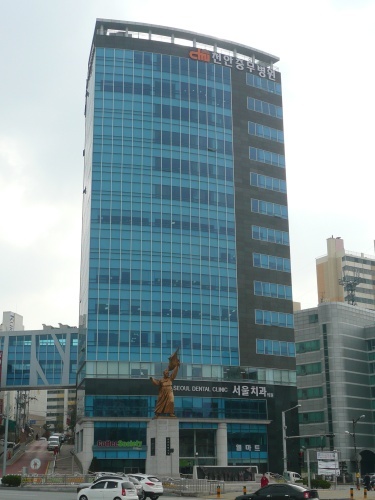 My aim was to scout out more ways of walking into the centre and to locate the Korea Exchange Bank, at which I will open an account once I’m able (KEB apparently has good a good set-up for transfering money to foreign accounts). I found, along with a big market along a street characteristically covered with a big, arched roof. I kept walking, passed an Indian restaurant that I’ll have to eat at some time and found myself at Cheonan Station. I went home, got some indifferent and over-priced pizza for lunch, went to work, finished said pizza for dinner, completed work and returned home again. The weekend followed. Where is Cheonan? I feel like I’ve been there before. Cheonan is somewhat south of Suwon, in north-east Chungcheongnam-do.